When the Sterling Corporation decided to introduce a new line of medium duty pickups their engineers wanted to design a better tow vehicle. They knew the customer had been asking for more horsepower on a smaller chassis, but at the same time a larger more comfortable cab. The customer wanted more freedom! The designers understood one of the hallmarks of this line would be the attention to detail. The goal was to create an unmatched vehicle with a distinctive identity. The new Sterling conversion gives its owners the freedom to pull the RV to the mountains, the horse trailer to a rodeo or a boat to the lake while demonstrating the owners unbridled desire to own a rugged, yet elegant vehicle. The engineers listened to the customer and designed a low profile chassis that would offer up to 365 hp. and 1,050ft-lbs. of torque. The larger cab offered a full 12 of additional leg room. 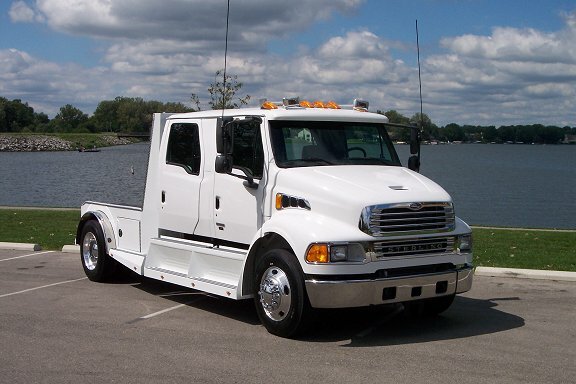 Plus a better turning radius creates a tow vehicle unmatched in its class. These new features enable the owner to create a safe but comfortable tow vehicle. They offer the owner the freedom to choose a basic hauler or an elegant masterpiece which displays the owners unique character. In pursuit of perfection the Sterling Corporation has created a timeless masterpiece of safety and design. We now offer the demanding customer both luxury and superior performance. We would like to take this opportunity to introduce to you our latest addition to the Sterling Trucks family. Please welcome the new Freedom Hauler into your family of vehicles. The new Sterling Freedom Hauler is available at a dealer near you.